Teams must be comprised of 5 members each. Each team will compete in one of the Playoff Rounds (see schedule here) with the winning team of each Playoff Round advancing to the Final Championship. Additionally, there will be a Wildcard Team selected for the Final Championship. The Wildcard Team will be a team that did not win their Playoff Round, but did solicit and receive the most donations (more on that below). Four (4) teams will compete for the Championship; the winner of each Playoff and the Wildcard Team on Thursday, August 22nd at 7:00pm. 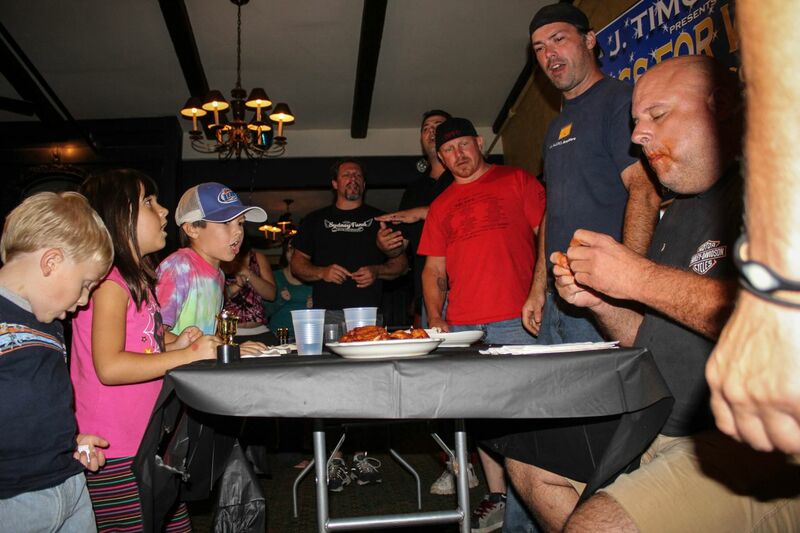 All 4 team members (excluding the Team Anchor) will eat 4 wings as quickly as they can, simultaneously. 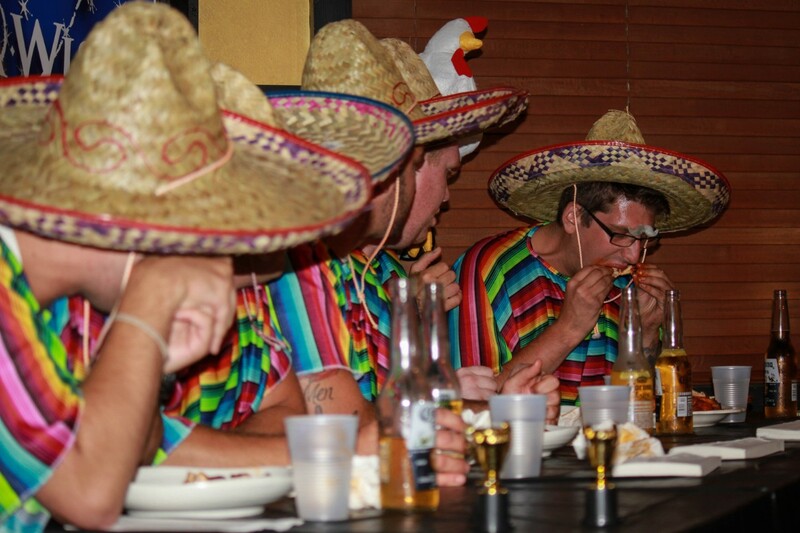 When all 4 members have finished their 4 wings, the Team Anchor will begin and eat as many wings as possible with the time remaining. If you participated last year, you’ll notice we changed it up a bit, after receiving great feedback from the teams and audience. Why are we doing it this way? Even if you aren’t the faster “eater” around you can still be on a team; the key is the Team Anchor. So your team can have many different types of members – who only have to eat 4 wings fairly quickly – while the Team Anchor should be fast. Families are encouraged to enter! NO PROFESSIONAL EATERS. There will be some prizes for the winners, but this event is really about fun and the charity, so professional eaters are not allowed. Previous “Champions” are excluded from participating. 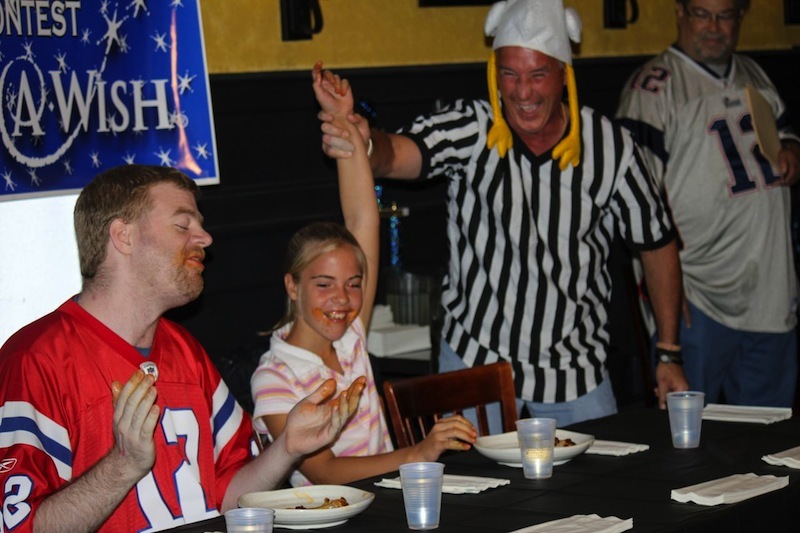 The entrance fee for each team is $100 ($20 per Team member), which will, of course, go directly to the Make-A-Wish Foundation. When selecting Team Members verify that each is available for the all of the Playoff Rounds and the Championship. On the registration form we will ask for any date your team cannot compete, but it’s going to be challenging to schedule this so we hope each Team makes itself available for each date. There will be a mandatory Team Meeting at J. Timothy’s on Tuesday, July 30th. At least one member of each Team must attend. Come up with a fun and creative Team name. There will be a prize for Most Creative Team Name. Also, be creative with the “outfits” you wear during the competition. T-shirts? Costumes? Accessories? There will be a prize for Best Dressed (awarded to the Team that is the most creative with their attire). Each Team will be asked to solicit donations for Make-A-Wish. You’ll be a given a J. Timothy’s bucket in which to keep the donations; the goal is to fill up the bucket! Ask friends, family, co-workers to chip in for a good cause! This is important not only because of the charity involved, but because even if your Team loses your Playoff round, you could still be selected for the Finals by having collected the most donations! Team registration will take place online, here on this site, starting Tuesday, July 9th at noon. You can check out the registration form now to see what information we’ll need, but please DO NOT REGISTER until the date/time specified. Any questions? Leave them in the comments and we’ll get back to you, or email nikki [at] jtimothys.com. Thanks for your interest; we are so excited for this event! 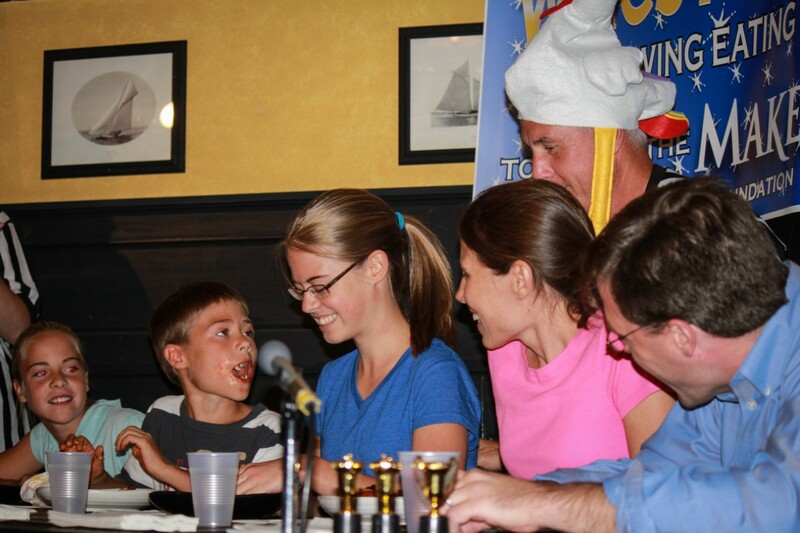 Last year’s event raised over $11,000 for Make-A-Wish, which allowed a child and his family to visit Disneyland. Let’s do it again!